KANSAS CITY, Mo. — Lawmakers and veterans are reacting to the Supreme Court decision to allow President Trump's proposed partial transgender ban to became military policy. “I was ultimately surprised when I saw it today,” said Suzanne Wheeler. A 2017 tweet from President Trump saying transgender people should not serve in the military hit close to home for Wheeler. “I knew that I felt and identified as a woman at a very young age,” said Wheeler. 30 years in the military, including a 2010 deployment to Afghanistan, Wheeler says she had to hide who she really was and only shared who she really was with some. It wasn’t until the end of her military career that she could really transition to a woman in uniform. “I had some very conservative folks that I worked with, that’s the way the military is, and they were as long as I could do my job, that’s all they cared about," said Wheeler. The ban has had mixed opinions. Hartzler also is concerned about the financial impact transgender members would have on the budget for the military. Wheeler says the medical costs would make a very small impact. 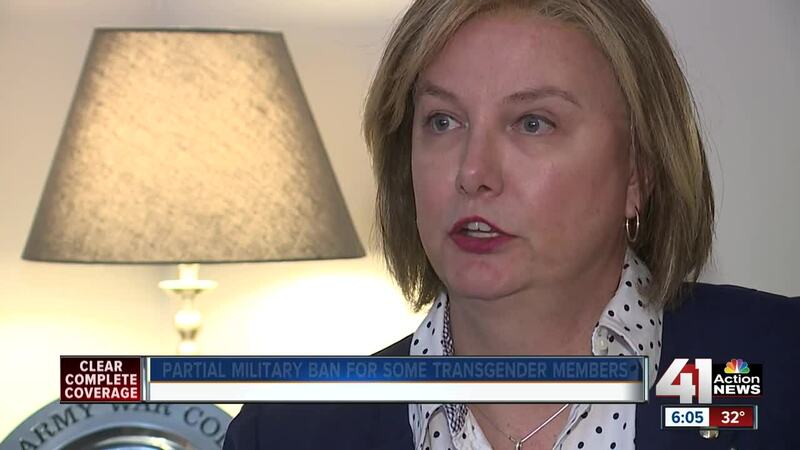 “Not everyone who is transgender is going to have surgery, some will only require hormone therapy, some may require no therapy and just want to present in their identified gender,” said Wheeler.